The new build includes improvements to the Phone, Mail, and Calendar apps. You’re zooming down the freeway on the way to an important business lunch, but you’re not going to be able to make it in time. How do you let everyone know to start without you? A new build of Windows 10 Mobile has the answer. 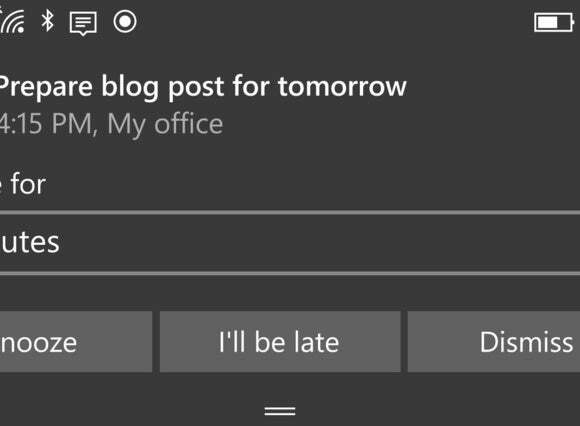 On Thursday, Microsoft launched Build 14283 of Windows Mobile 10 for the Fast Ring, which contains an update to the Mail and Calendar apps: “I’m running late,” an option that appears next to the “Snooze” and “Dismiss” options that are already there. Mail also includes a long-awaited option to move spam email to the Junk folder via a long press on the offending email. 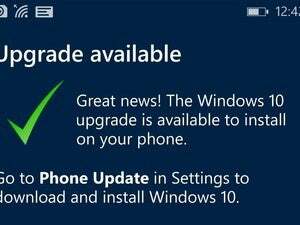 Microsoft said the updates support phones that originally shipped with Windows 10 Mobile: the Lumias 950, 950 XL, 650, and 550; Xiaomi Mi4; and Alcatel ONETOUCH Fierce XL. In his blog post announcing the build, Microsoft corporate vice president Gabe Aul reiterated that Windows 10 Mobile is coming for older phones, but he didn't say when. Microsoft also added an update to the Phone app that displays a small icon indicating the number of missed calls or voicemails you’ve received since you last accessed the app. A new Feedback Hub will be arriving soon, Aul added, where users can provide comments and suggestions to Microsoft for future use. Why this matters: While new additions to the operating system are appreciated, it’s nice to see some new features coming to the apps themselves as well. I really like the “I’m running late” addition; it’s so simple it seems obvious in retrospect. Yet since Microsoft is looking for feedback, here’s a suggestion: Allow the person running late the option to automatically display his or her location on a shared map, to visually show how far away that person is. You could even let Bing calculate the time to arrival.